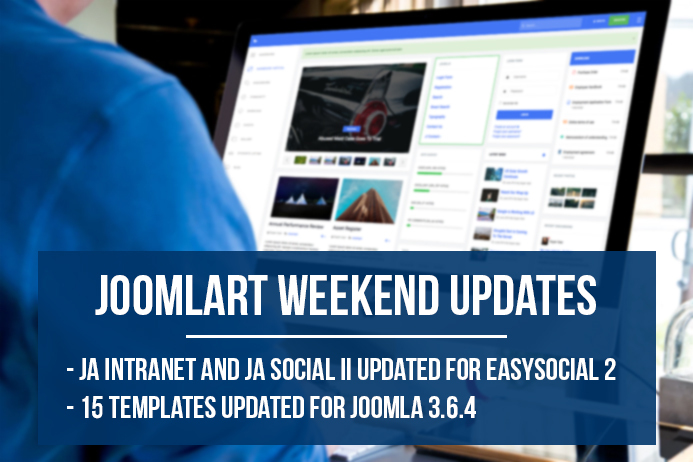 This week, JoomlArt team released JA Intranet & JA Social II for EasySocial 2 support and 15 Joomla templates updated to Joomla 3.6.4. JA Intranet and JA Social II templates support Easysocial with customized style and layout, since EasySocial 2 released, we updated the 2 templates to support the new version of EasySocial. 2. 15 Joomla templates updated to Joomla 3.6.4. Last week, we released 17 templates updated to Joomla 3.6.4. This week, we updated 15 more templates for Joomla 3.6.4. The releases include bug fixes for user's reported issues. Click on changelog links for details.